Wicked Witch "Flying Over Castle" 120MM Music Globe | Wizard of Oz Globes & More! Figurines | One Price Low Flat Shipping! From the San Francisco Music Box Company Wizard of Oz Gift Collection, Wicked Witch Flying Over Castle 120MM Music Water Globe. Made of stone resin. Measures 8.5" tall. This finely crafted musical water globe features the Wicked Witch flying on her broom stick above her castle off to find her "little pretty." Dorothy and her traveling companions, Scarecrow, the Cowardly Lion, and the Tin Man are seen trembling on the yellow brick road, hoping not to be found! The 18 note wind up key lights up the globe and activates the tune, "Optimistic Voices." 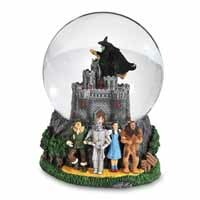 Terrific Wizard of Oz collectible!